San Diego Comic-Con is where science fiction, fantasy, comic books and toys collide, so what better place for LEGO to show off their upcoming building sets? The four days of Comic-Con equal four days of huge LEGO reveals across every major nerd-relevant product line. What's in store for brick fans? Now that the LEGO Lord of the Rings sets are in stores everywhere (more on that next week), the brickyard fantasy factory turns its cylindrical head towards the next film, due out in December. Fans eager to put a tiny Martin Freeman in their pockets need look no further. Plus, one lucky raffle winner will walk away with a one-of-a-kind 5-inch Bilbo, which seems awfully small for a... oh, Bilbo. Sorry. 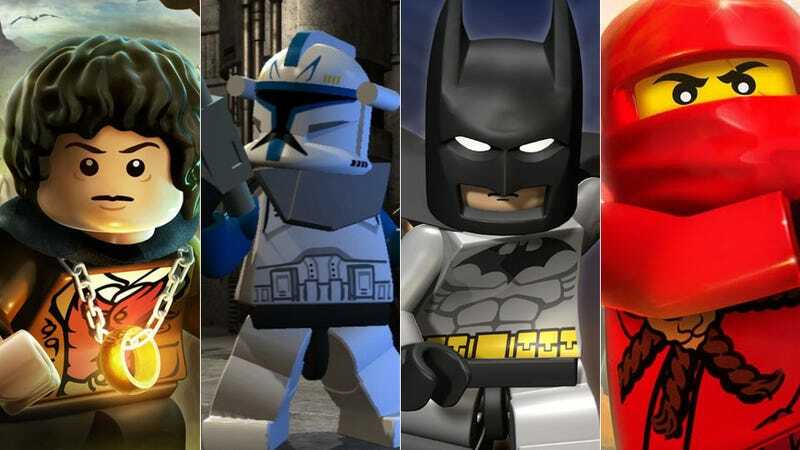 Both Marvel and DC are getting brand new LEGO Super Heroes sets for 2013. Not only will con-goers get an early peek at what's on the super heroic horizon, LEGO will be giving away special LEGO Super Hero minifigs — Marvel Venom, Marvel Phoenix, DC Shazam and DC Bizarro. There are only 1,000 of each, and lucky fans that get their hands on one will also have a chance to win fabulous toy and comic book prizes. And the raffle? Who wants a 5-inch LEGO Batman? LEGO has 20 new Star Wars sets slated for release in 2013, and their bringing one of the best to Comic-Con: the LEGO Star Wars Rancor Pit. They'll also be airing a new episode of the Clone Wars animated series, and one lucky fan will win a one-of-a-king 5-inch Luke minifig. The ninja battles are going strong in the Ninjago line, bolstered by a cartoon series and the promise of an exciting announcement that will deepen the story behind the masters of Spinjitsu. And of course, there's a 5-inch green ninja to win. I'll be stopping by LEGO tonight during preview night to bug the living hell out of anyone that looks even vaguely official. We'll have more on the special announcements as the con begins. Stay tuned!